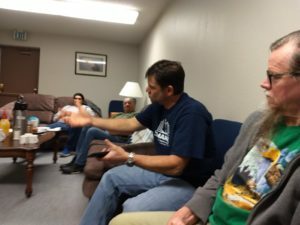 In Havre, Montana, a unique Go Montana story is unfolding. It all started in the mind of Pastor Chris Richards of Immanuel Baptist Church who was seeking a way to connect with adolescent kids on the Rocky Boy Indian Reservation. He pondered how he could utilize the warrior spirit of Native Americans as a bridge to the Gospel. What happened next ignited a passion in the heart of his daughter, Taylor, and a former heavy weight boxer, Ted Reiter. What a combination! 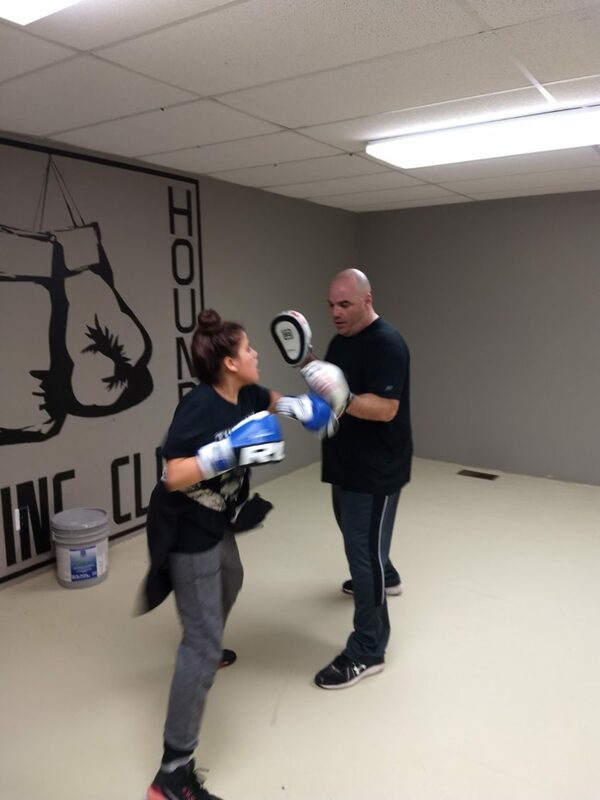 Taylor began boxing when she was 13 and trains consistently with Ted Reiter, who uses his experience in the ring to teach proper footwork, balance, and technique. 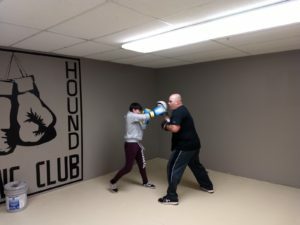 When Pastor Richards asked them about starting a boxing ministry, they went “ALL IN” to create the Rock Hound Gym in a multipurpose space of their facility and to craft a strategy to apply the lessons of boxing to life and faith. “Everything you do, do with purpose,” says Ted. The Apostle Paul said in 1 Corinthians 9:26, “So, I do not run aimlessly; I do not box as one beating the air.” In life and faith, you want your punches to count. God opened the door to ministry to Native American kids when Pastor Chris began preaching on Sunday afternoons at Chief Cornerstone in Box Elder, a long-time mission church of Immanuel. He saw the need and wanted to build community there. 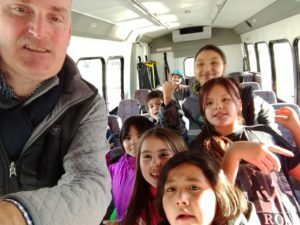 He led his church to buy a bus and each Wednesday night, he travels about 25 miles to bring kids to his facility in Havre. The older kids are engaged by Taylor and Ted. 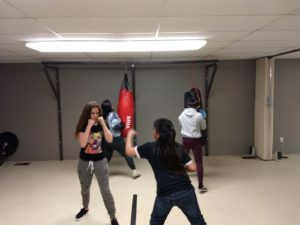 Their vision is for teens to find their value in Christ through boxing. After the training, they feed the students, share a Bible lesson, and share their faith stories. The relationships are beginning to grow and Taylor sees the girls starting to open up about their lives. “This is an open door to share about Christ,” she says. The Rock Hound brand came from the heart of Taylor. She explains, “A rock hound by our definition is someone who seeks out precious stones in the rough. We’re seeking out these youth in hopes of showing them their worth in Jesus in the midst of whatever rough they’re going through.” She found this inspiration from 1 Peter 2:4-6. As you come to him, the living Stone—rejected by humans but chosen by God and precious to him— 5 you also, like living stones, are being built into a spiritual house to be a holy priesthood, offering spiritual sacrifices acceptable to God through Jesus Christ. 6 For in Scripture it says, “See, I lay a stone in Zion, a chosen and precious cornerstone, and the one who trusts in him, will never be put to shame. The bus also picks up younger kids who get lessons and activities designed by Child Evangelism Fellowship. These kids get some one-on-one time in the gym, too. A few adults travel with the students from Box Elder for Bible Study. Students and parents from Havre have also begun to come. This program has changed the dynamic of their Wednesday night activities and has sparked a lot of excitement in the church. A weekly prayer meeting with 6-8 people was transformed into an intentional outreach and disciple making ministry with 35 people attending consistently, and it continues to grow. 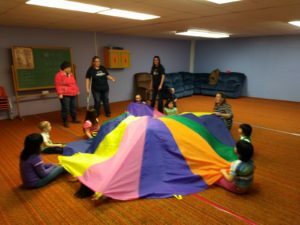 What began in frigid below zero temperatures in February, is expanding weekly as kids tell other kids and the thaw of spring sets in across the Hi-Line. This is a great example of our Go Montana initiative at work. Immanuel Baptist Church is going, telling, and serving! 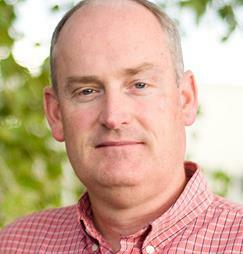 Darren Hales is the Church Strengthening Team Leader of the Montana Southern Baptist Convention.